This innovative, environmentally-friendly Energy Recovery Plant is operated by Shetland Islands Council, supplying heating to domestic and non-domestic properties in Lerwick by incinerating combustible wastes to heat large quantities of water. The plant has capacity to handle up to 26,000 tonnes of waste annually. A licensed landfill site , completed in April 2006, lies directly behind the base, providing a convenient local disposal route for non-hazardous (non-recyclable) wastes and asbestos. Also available on-site is a Drill Cuttings Process Plant for treating contaminated drill cuttings shipped from offshore installations. The plant process recovers oil and water from drill cuttings to produce inert dry waste. The local scrap merchant and waste management company augments the services and capabilities of the decommissioning facility; providing plant, labour and expertise for numerous previous projects. Additionally, a local licensed disposal route for oily wastes, fluids and sludges is available on the islands. 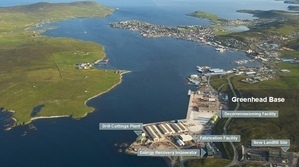 Shetland’s capacity to handle large decommissioning projects is demonstrated by the combination on offer at Lerwick: deep-water access and berthing, extensive, tailored quayside facilities, and the depth of experience, skills and resources available. Shetland’s many advantages to the oil and gas industry include its adaptability in the scope of contracts it can handle. The facility is designed to accommodate piece small projects, as well as piece large. The facilities and expertise available in Shetland make it an ideal provider of decommissioning and servicing for the subsea sector. Lead contractors offer a comprehensive onshore decommissioning service including Front End Engineering, Feasiblity Studies and consultancy Services.